The soul of a being is an Anuic feature of that entity, which seems to be closely connected to both its animating consciousness and the form of its body. For this reason, the soul may be called an animus or morphotype, though these terms can also refer to the related concept of a vestige. All living things on Nirn seem to have souls, though the souls of more intelligent and stronger creatures tend to be "larger" (more powerful). Under ordinary circumstances, the mind and soul of a mortal are one. Souls are generally immortal, although they are easily trapped and can be utterly destroyed. In death, a mortal's soul usually journeys to Aetherius, where it remains forever. Mortals who serve a Daedric Prince, who retain strong emotional ties to the mortal realm, or who are affected by certain spells, may instead find their souls on Mundus or one of the planes of Oblivion. Daedra lack souls, each one possessing instead an animus called a vestige. When a Daedra is destroyed, either in Mundus or in Oblivion, its vestige is banished to the Void, and attracted back to the plane of Oblivion where it originated. There its body reforms from Chaotic Creatia (e.g. the Azure Plasm of Coldharbour). It is possible to trap the animus of a Daedra by magically infusing it into an item. It is not known what happens to a Daedra killed in Aetherius, though it has been suggested that this may be the one way to permanently kill a Daedra. While the precise nature of the soul is not known, it is considered to be a potent form of mystic energy. Soul Magic, Enchanting, Necromancy, Mysticism, and Conjuration all make use of this energy. Soul gems are the most common method of trapping souls, especially for enchanting, although items such as animus geodes can be used in some cases. Souls that have been bound through the use of magic can be used to enchant and charge magical items, animate undead or artificial constructs, or cast powerful destructive spells. For this purpose, creatures' souls are usually trapped at the moment of death, and bound within soul gems. Soul-trapping spells and soul gems were standardized in the early centuries of the Mages Guild. Soul gems come in many sizes, corresponding to the size of the soul that the gem can trap; the standard sizes are "minor", "petty", "lesser", "common", "greater", "grand" and "divine". Souls are also categorized into "black" souls, the souls of sentient races, and "white" souls, the souls of lesser creatures, although the distinction is arbitrary. The division was implemented in the early days of the Mages Guild at the behest of Vanus Galerion, in an effort to limit the practice of soul trapping. By the Third Era, the standard spells and gems of the Guild (as well as Azura's Star) could only capture white souls, and this practice was so thoroughly ingrained that most mages continued to avoid trapping black souls well after the Guild was disbanded. Necromancers, led by the Order of the Black Worm, pioneered a way to bypass this limitation by creating black soul gems. Although capable of storing black souls, the gems were dangerous to handle as small bits of the caster's soul could leak into the gem. When a mortal soul is trapped in a soul gem, it is sent to the Soul Cairn for all eternity. It is not known whether some part of the soul is sent to the Cairn immediately, or if souls end up there only after the energy they contributed to the gem is spent. In at least a few cases, trapped souls have retained consciousness within a soul gem itself. 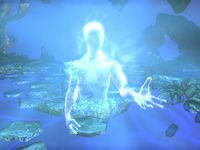 Curiously, adventuring mages have often reported being able to fill soul gems from the animi of creatures without souls, including Dwemer constructs, soul shriven, and Daedra. 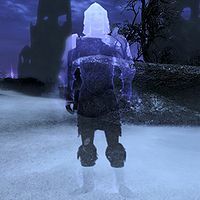 It's not clear if this is due to soul-trapping spells catching enchantments or filled soul gems near the target (many Dwemer machines contain soul gems), or other animating forces, such as vestiges, being trapped in place of a soul. Mortal souls can become trapped on Nirn, where they linger as undead. For more about the soul shriven, see the main article. Soul shriven are mortals who have had their souls taken by Molag Bal. Cultists devoted to him ritually sacrifice victims, who are pulled into Coldharbour, their souls stolen and replaced by vestiges at the moment of death. This process leaves a soul shriven's mind and body intact, and in fact, immortal, regenerating after death as the Daedra do. It also reduces the willpower of the victim, allowing Molag Bal to enslave the soul shriven for eternity. However, the process is imperfect, and over time both the mind and body of a soul shriven decay, resulting in a violent, feral, decrepit creature. Some soul shriven also claim to still feel a connection to their souls, believing that they can feel sensations that correspond to the treatment of the soul gems in which their souls are kept. It has been suggested that the soul shriven experience this effect because mortals require an Anuic principle to maintain their forms. In this case, there might exist "paragon" mortals with an additional Anuic aspect, who would retain their forms and sanity after becoming soul shriven, while still becoming immortal. This hypothesis was confirmed during the Planemeld, during which some mortals became capable of fighting to defend Nirn even without a soul. Dov (Dragons and Dragonborn) can absorb the souls of fellow dov. This grants the recipient a portion of the knowledge and skills of their fallen opponent, but it also destroys the dov permanently, rendering it beyond the ability of any ritual to resurrect. Because of their connection to the Hist, the souls of Argonians are said to have unique qualities not shared by souls of other races of Tamriel. They are bound to their Hist tree and their souls normally return to it when they die, but if that is prevented or the tree is suffering, the soul remains as a ghost. ^ a b c d Events of Elder Scrolls Online. ^ Mannimarco's dialog in Elder Scrolls Online. ^ Haj Uxith loading screen in Elder Scrolls Online. This page was last modified on 10 February 2019, at 11:44.